little bee books, 9781499805369, 32pp. 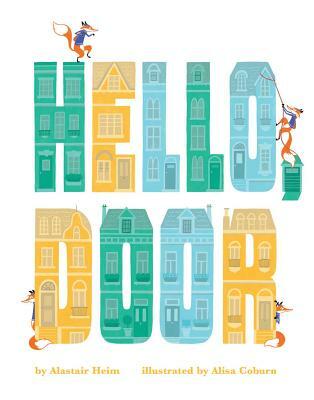 In Hello, Door, kids can follow a thieving fox as he greets everything he sees in a home that isn't his. In this ode to the classic "Goldilocks and the Three Bears" story, kids can follow a thieving fox as he greets everything he sees in a home that isn't his. He collects fine art and jewelry, practices his golf swing, and devours a tasty snack along the way. But just when he thinks he's in the clear to leave with all the goods, the owners of the house-a mama bear, papa bear, and baby bear-come home. They chase him through the house, and when the mama bear catches him she promptly throws him out. But she throws him so far that he ends up in a much nicer neighborhood-in front of a mansion, in fact-where he can begin his mischievous adventure again! Alastair Heim's love for writing started in ninth grade, when a poem that he wrote won second place in a statewide poetry contest. Years later, his then three-year-old daughter began repeating every word he said. This inspiried him to write a bedtime story in which they could both participate. Alastair's debut book for Little Bee Books, Love You Too, was published in Fall 2016. He lives in Missouri with his wife and three word-repeating kids. Alisa Coburn is an illustrator and designer who lives with her family in the English countryside. She loves to draw and color as much as she did when she was a little "piglet," and she can't believe that she gets to do this for a living. Alisa is also the illustrator of Love You Too, a picture book on Little Bee's Fall 2016 list. Find out more about Alisa at alisacoburn.com.